The Credit River Parks Strategy (CRPS) will, over the next 25 years, invest in the conservation, management and growth of 37 parks and natural areas along the Credit River, one of our most treasured natural resources. The Credit River Parks Strategy as approved by Council on September 18, 2013 will connect residents to the natural environment and provide recreational opportunities that promote health, well-being and an enhanced quality of life. More than 35,000 stakeholders were engaged in the development of the strategy including residents, community groups, external agencies and City staff. 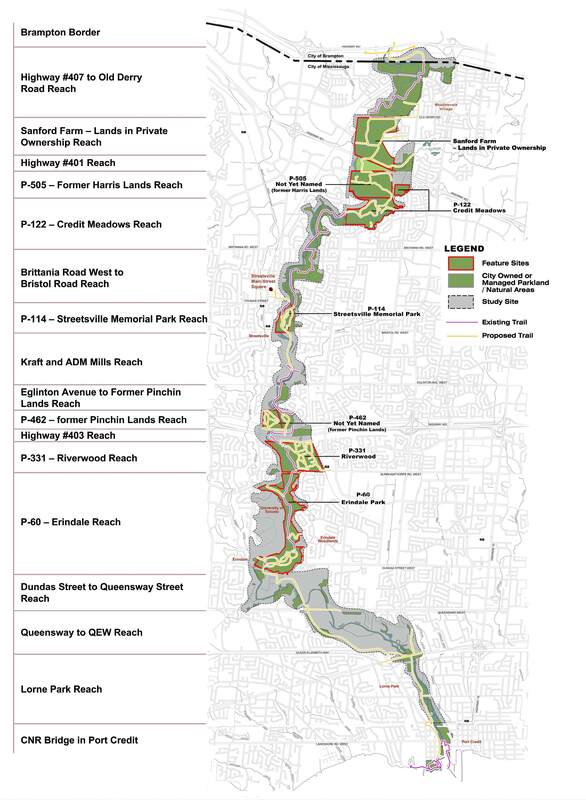 All told us they want to be able to connect with and have access to this area for a number of recreational uses including cycling, walking, hiking, canoeing and kayaking. The strategy recommends a number of actions including a continuous trail from Port Credit to Mississauga's northern border, new bridges and trails to connect neighbourhoods and provide links to transit hubs, educational institutions and cultural experiences. It also recommends habitat restoration and new opportunities to further enhance water activities such as fishing, canoeing and kayaking. Over the past two years the CRPS has received the CSLA Regional Award, and been nominated for The Credits, Natural Heritage Award. These honors have reinforced the strength of the vision identified in the Master Plan. Currently, the CRPS is undergoing an internal budget review that will assist in clarifying the priority projects for each of the seven (7) featured sites, trail connections, cultural and natural heritage aspects of the plan. The Credit River is important to the City's "green" infrastructure. The new strategy will ensure that it is preserved and enhanced for all to enjoy today and in the future. *Please be advised that the associated implementation schedule is an estimate and will be dependent upon the degree and rate of funding allocated through City capital programs and external funding sources.